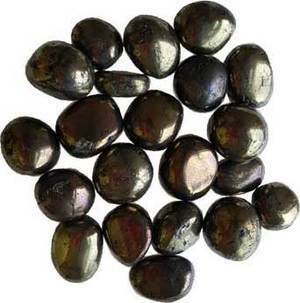 Chalcopyrite, most powerful aspect is that it is connected to mediation, it is a stone of mystic and abundance. It is powerful to make connections to the higher spiritual and mystical realms having a positive vibration known to increase happiness, joy and belief in one-self. It has powerful resonance within the higher chakras. Sold by approximate weight - not stone size or count. 26 - 32 stones. 3/4" x 1" - 1" x 1 7/8"